With just one look, it’s easy to see why Chile's Central Valley outside Santiago is one of the world’s powerhouses when it comes to wine. Sandwiched between the cool rocky coastline to the west and the Andes mountain range, and the Atacama Desert to the north and glacial Patagonia down south, the Central Valley climate makes for an ideal soil that’s perfect for growing the French varieties of grapes this region is known for and yielding some of the best Chilean wines: Cabernet Sauvignon, Merlot, Carmenère, and Franc. Malbec and Syrah are also widely grown here. If you love wine and wine tours, Chile is a good place to be. Chile has been producing wines since the 16th century, from vines brought with early French immigrants, and with improved technology and technique, the country is now the fifth largest exporter of wines in the world, and the seventh largest producer. Chile is primarily a red wine region, though their whites are very good. But since it’s the soil that ultimately makes the wine, and the country’s climate and weather is so unique, the grapes needed for reds get extra special treatment from Mother Nature, just as the whites of a region like, say, Austria, reflect the climate, weather, and soil of central Europe. If time or budget is a concern, or want to visit wineries close to Santiago, there are several you can visit using the metro and a short cab ride, like the very popular (and touristy) Concha y Toro Chile. Santa Rita Winery is a popular local choice along the metro and you can also take the Turistik Hop-On, Hop-Off bus tour that includes a visit to this vineyard. But if you’re looking to explore the Chile wine regions between Santiago and the coast, you can take an organized group wine tour or simply head out on your own. Getting around by car is surprisingly easy once you leave bustling Santiago. 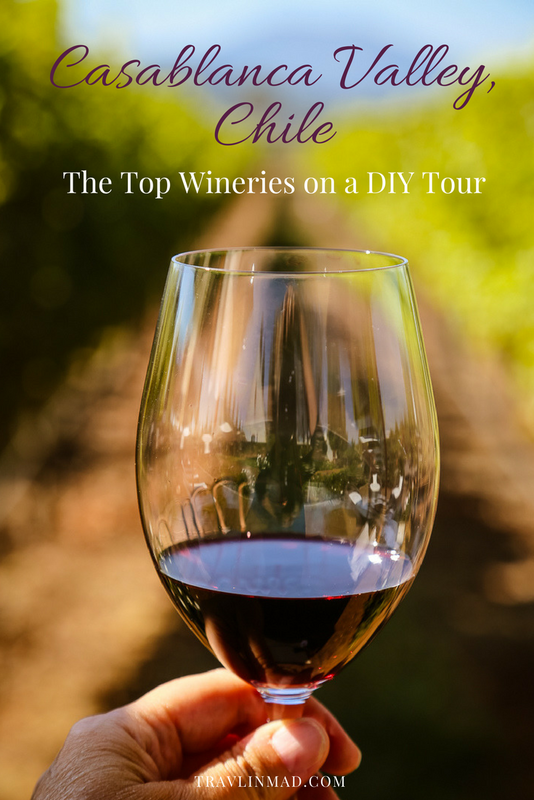 Having your own car on a self-guided DIY (drive-it-yourself) wine tour also allows you greater flexibility to spend time and linger at the Central Valley's best wineries. There are so many wine producing regions, valleys, and subregions in central Chile it's hard to keep them all straight. As you explore the country from north to south, it's easy to see (and taste) the unique flavors in both the wines and the traditional Chilean foods that pair so well with them. The Central Valley closest to Santiago (Maipo Valley and Colchagua Valley among others) have excellent wineries, but we found three wineries we absolutely loved a little further west in the Aconcagua region (San Antonio Valley and Casablanca Valley). TIP: These three wineries make perfect additions to a coastal day trip to the vibrant city of Valparaiso. The property also caters to families with kids, with stables for horseback riding, a pool, and a 10-room “casona” for overnight stays. La Casona de Viña Matetic is a boutique hotel located in a colonial building characteristic of the Chilean countryside of 1900, which was completely remodeled in 2004. The Casablanca Valley makes a great day or overnight trip from both Valparaiso on the coast or the capital of Santiago. Matetic Vineyards has a gorgeous 10-room “casona” for overnight stays called La Casona de Viña Matetic. See above for more info. From Valparaiso, we recommend staying in the charming coastal area of Algarrobo for your stay, just 15 miles from the Casablanca Valley. The Winery Boutique Hotel gets excellent marks for luxury-appointed rooms and a beautiful property. Check rates and availability. With any winery, check ahead to make sure they’re open as some wineries are seasonal. Some wineries also require tasting and/or lunch reservations as well. What is your favorite wine region around the world?